My passion for reading and blogging about children's books developed into a desire to write children's books. Last year, I submitted my first ever picture book manuscript to an online contest hosted by an eBook publisher. Even though my manuscript wasn't chosen as a winner, I felt like a children's writer for the first time and started to get more serious about the idea of writing for children. During the contest I noticed a fellow contestant, Julie Hedlund and began following her on Twitter. She used Twitter to promote a new picture book writing challenge she was organizing called 12 x 12 in 2012. I participated in the challenge, connected with fellow aspiring children's book authors and found that surrounding myself with like-minded people can be extremely motivating. 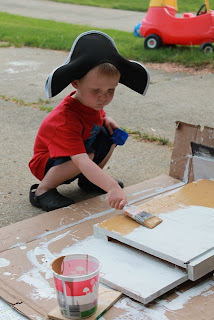 The 12 x 12 challenge helped me stay motivated and focused on learning more about writing for children, much like this blog has helped me stay motivated and focused on learning and reading with my children. I am thankful to Julie for creating an experience that has enriched the children's literature community by inspiring children's book writers to achieve more than they ever dreamed was possible. According to By Word of Beth, when Julie started 12 x 12 she too was looking for a way to stay motivated and focused. "I initially envisioned the challenge as a personal one that I would do on my own. Then, toward the end PiBoIdMo last year, I decided it would be nice to have company. I expected maybe 30-50 of my most faithful blog followers who were also picture book writers to join me. I NEVER could have imagined we'd end up with 400 strong!" As members of the 12 x 12 writing community we support each other in our journey to publication. When a member of the community receives a publishing contract we all celebrate. We celebrated this year when Julie received her first publishing contract. 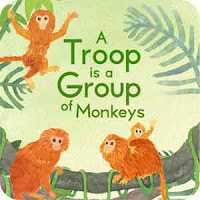 Julie Hedlund debuted as a children's book author with the iPad storybook app, A Troop is a Group of Monkeys illustrated by Pamela Baron and published by Little Bahalia Publishing. 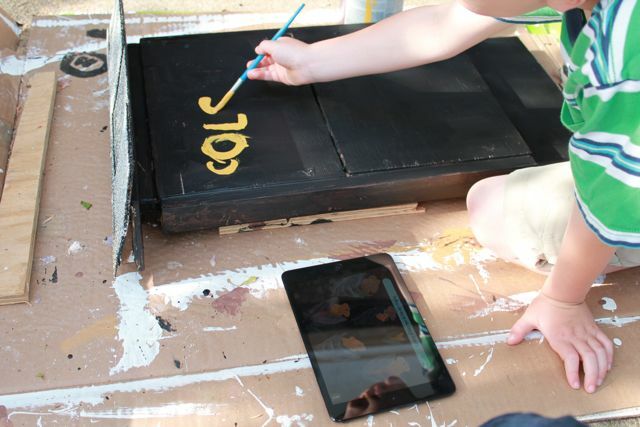 Troop is the first in the trilogy of apps dedicated to teaching children (and adults!) the collective nouns used to describe groups of animals. The second app in the series, A Shiver of Sharks, focuses on animals that live in or near the ocean, and is set to be released very soon. A third app will be released later in 2013 along a print book that will highlight the best collective nouns from the series. Julie Hedlund's A Troop is a Group of Monkeys features a get-stuck-in-your-head theme song by Tim McCanna, colorful illustrations and animations, easy-to-read rhymes, and the opportunity to learn 16 collective nouns describing some of the most recognizable animals. My kids were happy to learn that a group of owls is called a parliament and a group of hippos is called a bloat. We read Troop together many times and my children also explored the app by themselves -- which gave them more time to interact with the monkeys, lions, giraffes, and bats. My favorite page in A Troop is a Group of Monkeys was "A colony of bats spends the day clinging." Most likely this page resonated with me because I recalled a time last summer when my children and I enjoyed watching a pair of bats fly around our backyard. I expressed to my children how I thought it would be cool to have a bat house in our backyard. 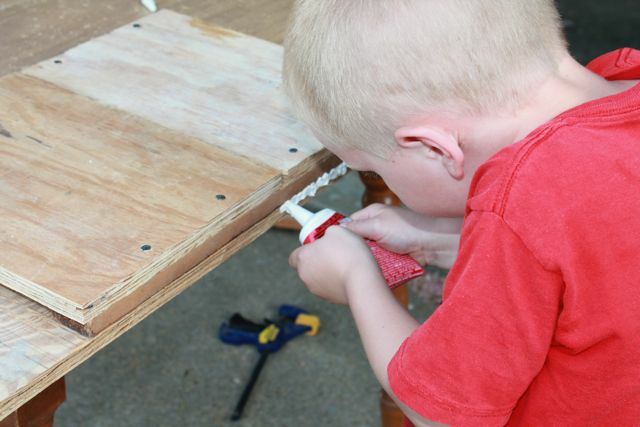 However, I never got the little nudge I needed to tackle the project. 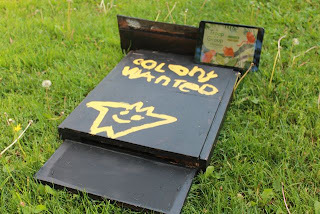 This week, almost a year from the original idea, I decided it was the perfect time to explore attracting a colony of bats to live in our backyard. Before starting this project I spent a lot of time researching on the Bat Conservation International website. I was pleased to find all the information I needed including the plans I would need to build the bat house. I also found oodles of information about the importance of protecting bats, the world's only flying mammal, including that "bat populations are declining everywhere and losing bats would have devastating consequences for natural ecosystems and human economies." Why are bats so important? I learned that they eat bugs that damage crops, pollinate plants, spread seeds in the tropics and elsewhere, and their droppings are great fertilizer! After reading through the plans to build the bat house about a dozen times, it was time to take the plunge and give it a go. I had my little helpers and they were eager to participate. Here, my youngest son clamps the wood to the table before we cut it to size. After all the cuts were made we started to piece everything together. Do you see the piece of wood with all the grooves? We cut those grooves into the wood to help the bats climb inside the house! We learned that keeping the house sealed is vital because bats want a dry and extremely warm house. My oldest son carefully caulked all the gaps. 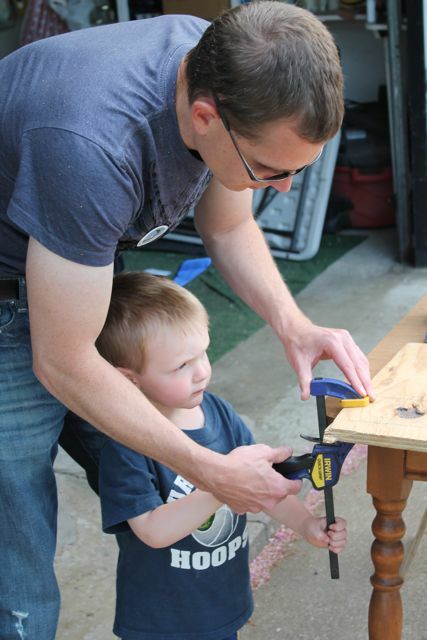 We primed the wood once the bat house was assembled. 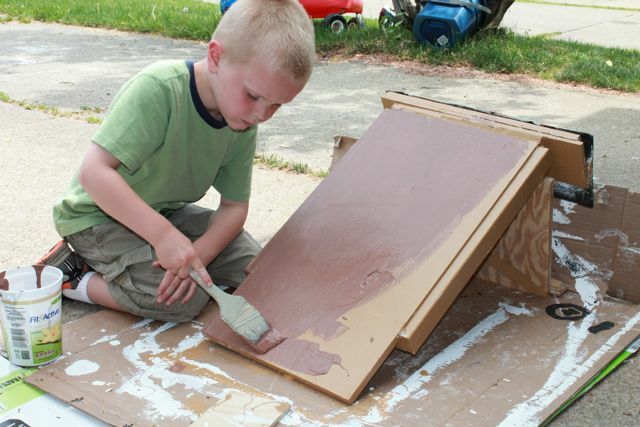 My boys started painting with a light brown color. Then, a dark brown for the second coat and finally black for the last coat. I felt doing it this way allowed them to see their progress as they painted. We decided to paint the words, "COLONY WANTED" on the outside of the bat house. 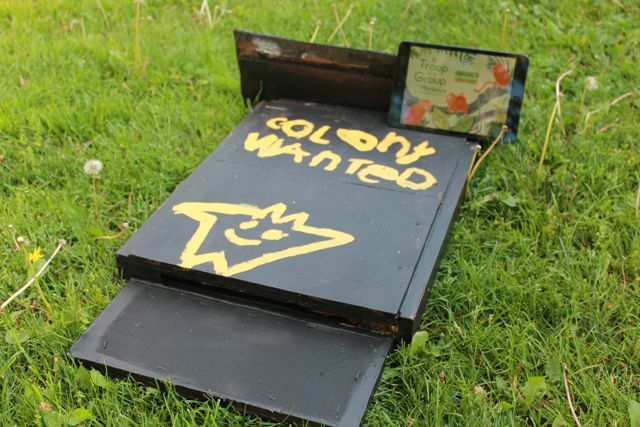 My oldest son used the Troop app to help him spell the word "colony." I asked my son if he could painted a bat on the front and without even thinking he painted a really cool bat! 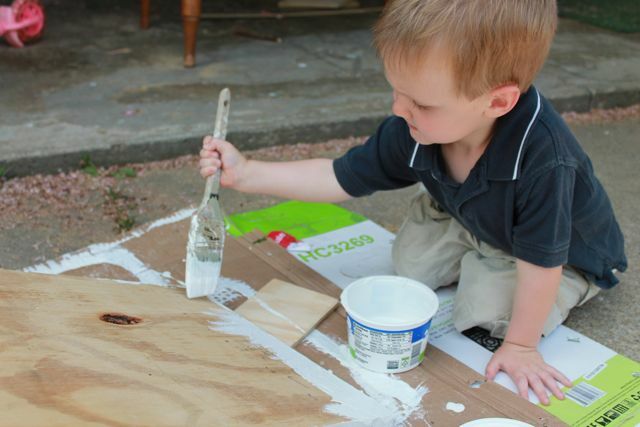 I love how kids approach art with a "no problem"-like attitude! The next step was to come up with a mounting mechanism. Thankfully, directions for mounting your bat house were also available. 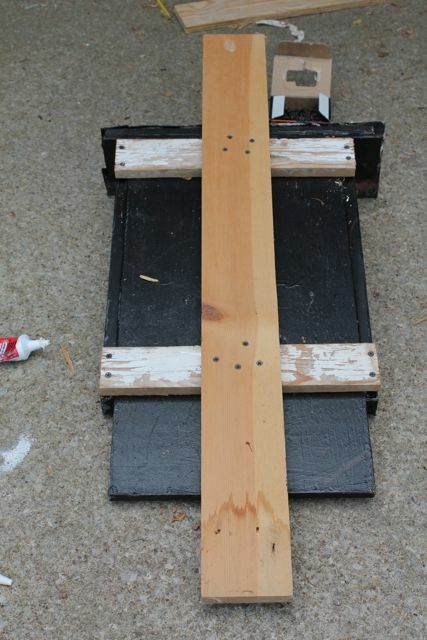 My original plan was to mount my bat house on a tree. But, research has shown that bats prefer bat houses mounted on poles or buildings. 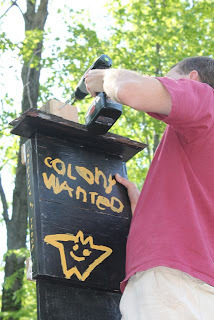 I decided to mount the bat house on a pole in the sunniest part of our back yard. I am so thankful for Troop. It was exactly the motivation I needed to complete this project. Now we just have to wait to see if the bats like our house. 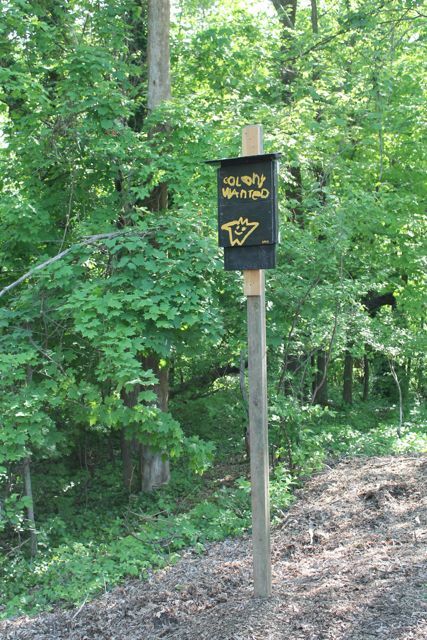 According to research, only 50% of bat houses will be occupied the first year. Then, if the house is not occupied after two years it is recommended that you try a new location. On my 8th birthday, what I wanted most of all was the "Fuzzy Pumper Barber Shop," a Play-Doh toy set. 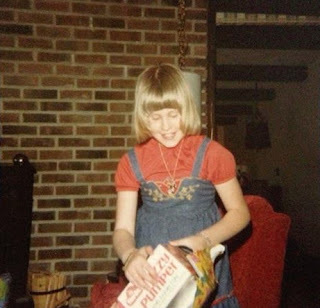 I'll never forget the thrill of opening that package, or the satisfaction of pushing the pump and watching the "hair" grow through the little holes in the people's heads. Then using those little plastic scissors to cut the hair. My favorite thing was to mix colors to give them rather psychedelic "dos." 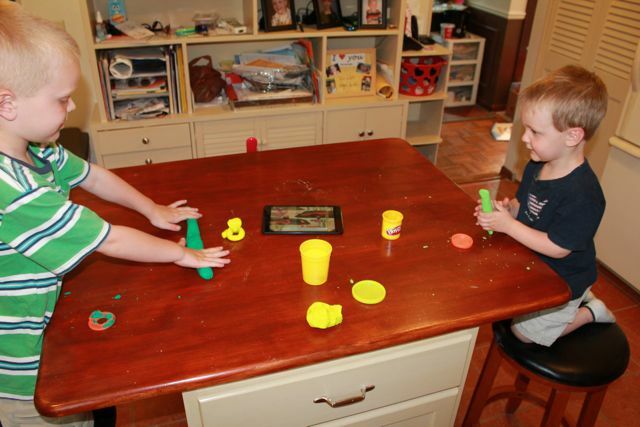 To this day I still love the smell of Play-Doh and often join my kids when they are having their own Play-Doh sessions. Julie, thank you for sharing your birthday story and photograph! 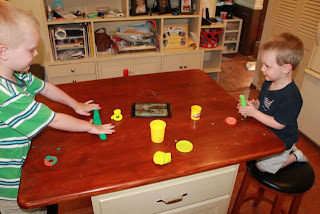 We played with Play-Doh this week in your honor, reread A Troop is a Group of Monkeys, and sculpted groups of animals. 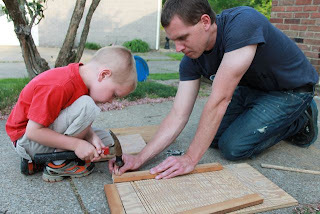 In the photo below my boys are making a quiver of cobras! My family and I hope you have a great birthday!